This crackle effect is something that I have been trying to figure out for ages. I have seen several various tutorials online but they either involved some weird product I didn’t have (and didn’t feel like buying) or some tedious work. But it turns out there is a much simpler way to achieve this crackle effect on cookies. And, I mean, it’s VERY simple! Alright guys, here’s the secret. 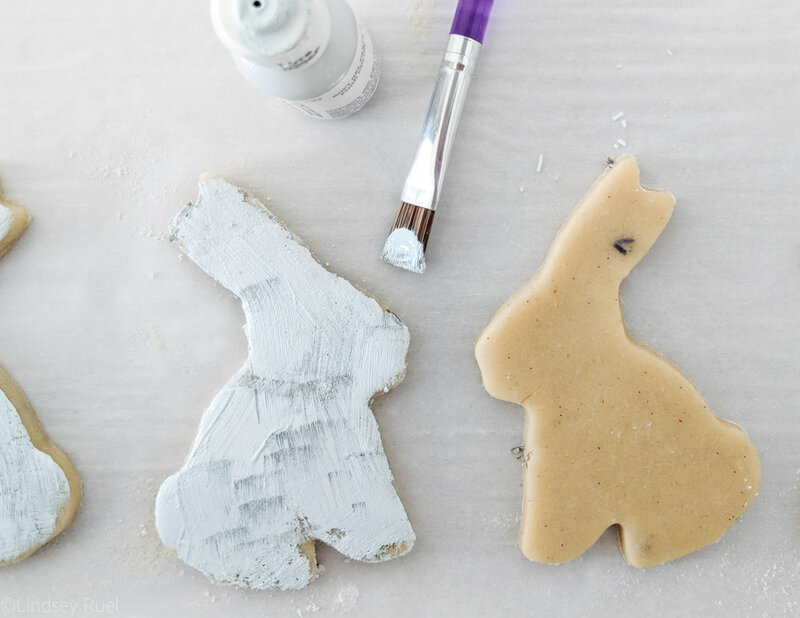 Just paint white (Or any chalky gel food coloring. I used Americolor Fog) over the unbaked cookie, then bake it. And *BAM* you have your crackle effect! So simple, right? I can’t believe it took me so long to figure it out. And I can’t even take credit for figuring it out. One of my cookie friends send me a very similar tutorial and we were both shocked out how easy it was. 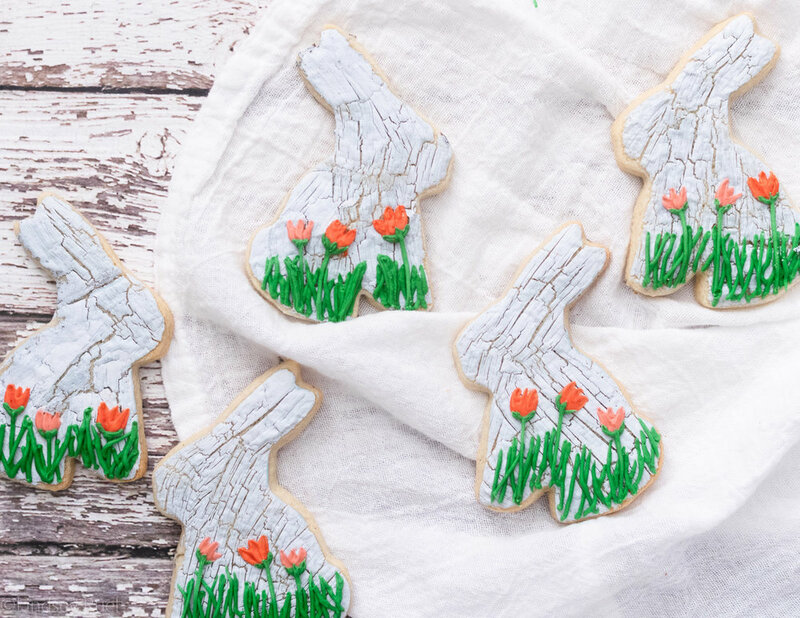 I love the look of these weathered bunnies, which are perfect for Easter, but they needed a little something else. I decided to add a few tulips to the bottom of these little bunnies. They, too, are easy to achieve. First I piped on some grass. Then I made three long teardrop shapes to create the tulip - two on the outside, then one down the middle. To finish them off, I added a little stem with the same green icing. These cookies definitely don’t look like they were easy to achieve, but they were! That’s what I love about them! 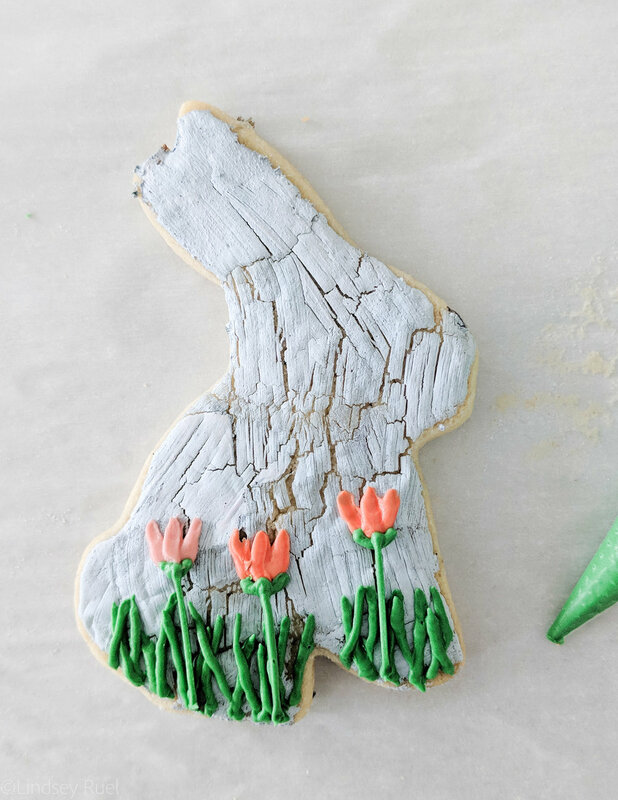 A simple cookie with very little piping required.